SBI PO Exam Pattern 2017– The exam pattern of SBI PO provides insights into the type and the total number of questions asked, the time allotted to take the test, subjects covered and the marking scheme of the exam. 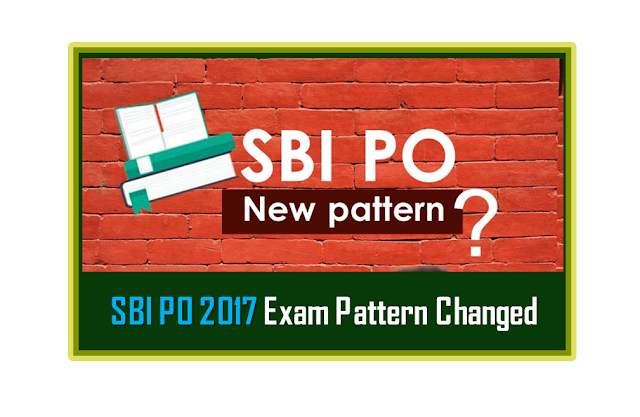 The State Bank of India will be conducting SBI PO Mains Exam 2017 on June 4, 2017 for candidates who have successfully cleared the SBI PO Prelims exam. Call letter for the exam will be released on May 22, 2017, and results will be declared on June 19, 2017. The shortlisted candidates will have to appear for group discussion and personal interview scheduled July 10, 2017 onwards. The final results will be announced on August 5, 2017. Selected candidates will be recruited to the post of PO/management trainee (MT). The SBI PO examination was conducted in February this year for nearly 2400 PO posts. State Bank of India has issued the SBI PO Recruitment notification for 2017. This year there are 2403 all India vacancies. This is an excellent opportunity for job seekers. So begin preparing now. Preliminary Examination consisting of Objective Tests for 100 marks will be conducted online. This test would be of 1-hour duration consisting of 3 Sections. Candidates have to qualify in each of the three Tests by securing passing marks to be decided by the Bank. The adequate number of candidates in each category as decided by the Bank (approximately 20 times the numbers of vacancies subject to availability) will be shortlisted for the Main Examination. The Descriptive Test of 30 minutes duration with 50 marks will be a Test of English Language (Letter Writing & Essay). The candidates are required to qualify in the Descriptive Test by securing passing marks, to be decided by the Bank. Descriptive Test paper of only those candidates will be evaluated who have scored qualifying marks in the Objective Tests and are placed adequately high as per total marks in the objective test. There will be penalty for wrong answers marked in the Objective Tests under SBI PO Exam pattern. For each question for which a wrong answer has been given by the candidate one fourth of the marks assigned to that question will be deducted as penalty to arrive at corrected score.